Jesus tells them to go present themselves to the priest. (It was also the practice that a leper who became better, needed to go to a priest for confirmation before re-entering society.) The lepers comply; as they do, they are “cleansed” of their leprosy. One man, seeing what happened, returns to Jesus, thanking him. There seems to be a distinction between being “cleansed” and being made “well.” One thought is that being cleansed meant that the leprosy was gone, but its ravages remained, whereas being made “well,” restored the flesh to its pre-leprous condition. Another thought is that being made “well,” addressed the whole person, encompassing the psychological and emotional aspect of having been ostracized and devalued as a person. 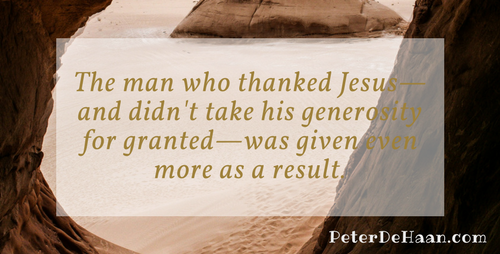 Whatever the precise meaning, it is clear that the man who thanked Jesus—and didn’t take his generosity for granted—was given even more as a result.